With smartphones becoming bigger rather than the mini-tech that was predicted, that mobile phone in your pocket could be weighing you down more than you expected so if the weight of your phone is something that bothers you check out the World’s lightest smartphones to lighten your load. The Nokia Lumia 620 gives you the Windows Phone experience on a lightweight compact phone that has all you need to keep connected with those that matter. The latest Windows Phone 8 is on board so you get familiar apps like Microsoft Outlook, Internet Explorer and Office apps so you can pick this phone up and use it easily. The dual-core processor delivers plenty of power when you need it and the 5-megapixel camera is ideal for taking snaps. NFC is on board for wireless charging and all the essentials such as social network integration and Wi-Fi are included too. The HTC One Mini is the compact version of the hugely popular original HTC One and this phone delivers plenty within its compact form. 4G connectivity and a stunning 4.3-inch HD display along with the superb Ultrapixel camera make this lightweight phone a heavyweight when it comes to features. HTC Sense makes this phone a joy to use with features like BlinkFeed that delivers all your essential information in a timeline onto the homescreen. The Sony Xperia E1 is a great lightweight mobile phone for anyone that loves music as it is packing the Walkman App as well as xLOUD and Clear Bass for fantastically clear and crisp sound when playing your favourite tracks. The Xperia design looks fantastic and the phone has a 4-inch display as well as a 3-megapixel snapper and 3.5G, Wi-Fi and GPS connectivity. The iPhone 5s bucks the trend when it comes to having a feature phone that has to be bulky too, lightweight at just 112g and slim this phone has more features than you can shake a stick at. The 8-megapixel camera is bursting with imaging options and the latest iOS 7 system gives you a simplified looking homescreen and fantastic user experience. There is a dual-core processor on board and the Retina display delivers impressive graphics quality. The Samsung Galaxy S4 Mini weighs in at just 107g so you get a whole bunch of great features in this smartphone without the need for added bulk. 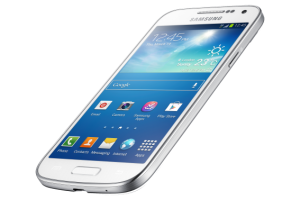 Like its namesake the S4 Mini has a lot of great Samsung Galaxy features such as Smart Stay and Infrared for TV control. There is a dual-core processor under the hood and with 3.5G, Wi-Fi, NFC and GPS on board as well as a microSD card slot and a stunning 4.3-inch screen you get all you need on this fantastic lightweight smartphone. The 8-megapixel camera captures great shots and includes sound and shot to add another dimension to your images. Which one of these phones takes your fancy? Do you think there is a better lightweight phone out there that is not featured on this list? Share you thoughts with us by commenting below or join the conversation on Google+.